HomeNice to know T-bird-isch stuff. Nice to know T-bird-isch stuff. For you nerds and other readers who like to google light sport aircraft technical info. I will put some of my findings here on this page. The keyword is T-bird of course. There are only about 20 AKKA registered in the world. 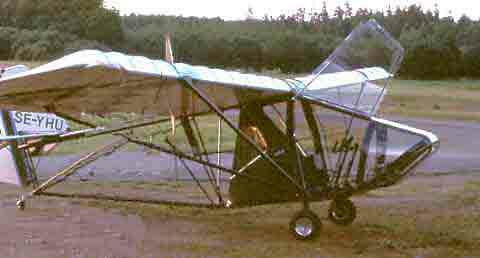 AKKA was the name AKKA Flyg AB gave to their Tierra II when they imported it to Sweden and changed the wings to meet the Swedish construction standard. I think the wing changes also were made to the Tbird in USA. I have learned now, by reading and searching info that my AKKA is a mix of TierraII and TbirdII. The previous owners has bought TbirdII tubes and parts for the airframe when so needed and turned the old Tierra frame to a Tbird. In the papers it still is a AKKA, and that’s ok, as long as the parts is better than the old ones. Things that differ is parts like the steering control yoke, dual steering cables on elevator and ailerons, another shape on the fuselage nose, different routing of the rudder cables/wires, the landing gear square tube, rudder pedals and brakes, tailwheel gear, cabin enclosure, engine and some other stuff. Here you have the First Tierra 1983. And here is my AKKA on floats, (a T-bird II with different wing). The thing I do, is to remove parts from the airplane for maintenance and then re-install them, it is not a restoration. I will buy new hardware and parts that needs to be replaced. I only use certified products and the maintenance is done according to the rules and regulations described in litterature available from EAA, PART145 A&P- technician schools and the manufactures instructions. I will apply for modification approval on the instruments and the steering yoke. The rest is ok as it is. It is not so easy to do modifications on UL aircrafts in Sweden, it needs approval from EAA and KSAK (Civil Aviation Authority). It also cost me money to do so. I am an licenced military Airframe & Powerplant technician and are allowed to do modifications and repairs on Swedish Ultralight airplanes, the rules say that it has to be an airplane technician to do so. It is not specified if the technician need to hold any type rating on the airplane. 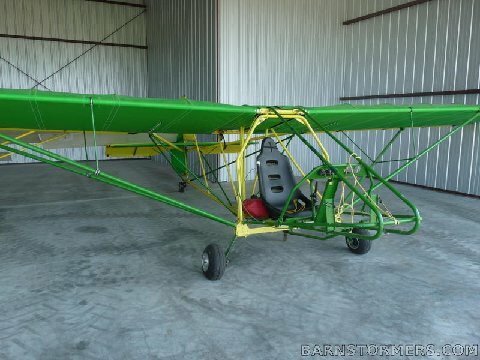 (There are no type courses on ultralight aircraft). Being an A&P technician is usaly 50% handcrafting an 50% paperwork. Working on Ultralights gives me more time in the hangar and less time on the computer desk. Just as I like it. But when there isnt any to talk to, I really love the internet. I can learn more on 1 year surfing on internet than I could learn on 5 years talking to people.First I have to find people knowing this stuff, then i need to go and see them, finally I need to remember the given info or write the info down. 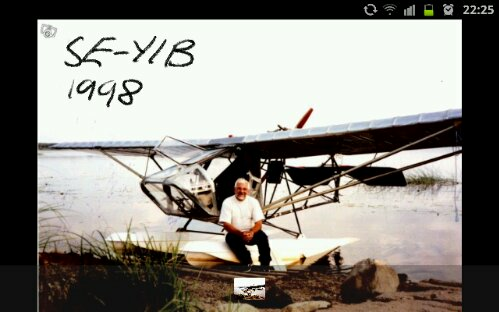 In Sweden there are also some “old school ” Ultralight pilots/mechanics left. Most pilots today fly modern ultralights, like Eurostar and CT. There are not many that still likes the 2 stroke engine. But there is some of them still going strong. It is to bad that they are hard to find. This is a relatively large country, but we are not so many. And most of the old school /true UL pilots lives in north of Sweden, I live in south of Sweden. So thank you Internet!!!! For giving me the opportunity to reach out and find what I am searching for. Ok, so I had a chat.whit one of my bosses at work. He has a Samsung Note, like me, and he really knows all about mobiles and stuff. He showed me what clouding is, (felt like a retard not knowing what clouding is). It’s quite useful actually. Because nowadays everybody has a lot of findings from internet and pictures laying around on different computers and smartphones. We all need some system to organise the multimedia mess. I also takes a lot of notes when I am building and searching for info. My nerdy boss tipped me about Evernote, a program based on notes and clouding. Clouding is when you put your dogital media on a server somewhere so that you can reach it whenever you like on any computer. Nice to have if your smartphone/ camera dies and your external harddrive burns up. Evernote is also I simple way of organising all my notes, pictures, to do lists, receipts, info and so on. I have made my first big use of Evernote now. I scanned (took pictures) the Pilot operator handbook for my plane, so that I can reach it on my Smartphone that I use as a flight GPS or on my computer. It is now secured. Hi. Thank you! Do you mean the manual? Or what is it that you need translated? Hello Chuck. The T-birdII assembly’s the same way as the Tierra2. I do have a wing assembly manual in swedish. But it is fairly simple. Just be careful not to bend the lower rear cabin tube, where the lower boom tube is connected. You need to jack upp that area. You can assembly the wings by yourself but then you will need a crane or something like that if you don’t want to risk scratch the fuselage. Mount the wing struts on the wing, laing the wing on the ground next to the fuselage. Then you lift upp the wing and connect it to the fuselage. The wing couples needs to be free of play. Insert bushings if the holes is elongated. Anders, – appreciated your last response. Two issues are dogging me, one is the plane I purchased has no paperwork, nor a Hobbs meter that would tell me the hours on the plane. I did find out it is a 618 rotax, not a 582, nor a 583 I was told. Sadly in my area, no one else has anything close to the Tbird II, no mechanics at all. Zero! One option is to tear the engine down, the other is to warm it up and run it for an hour at a time and keep an eye out for the engine temps and rpm variation. The second item that stumps me is the back trim adjustment. Can it be adjusted in flight or on the ground. My concern is locking the tube into place. Hello, Read all you can about the type. Be a member of the t-birtd yhaoo group and t-bird facebook group. I like the 618 Rotax. But it is important to clean the Rave valves every 100h. If I don`t know the history of the plane or engine, I always tear them down and inspect everything. i replace everything that is corroded, bent or damaged. All rubber parts are always replaced every 10 year. Is ther not a EAA organisation in your country? Get help from them. What country do you live in? Hello, see you have some good info here. I have a T-Bird 1 and would like to update my brakes and landing gear any ideas? And for landing gear, I use 8mm x 50mm spring steal. Do you have any pics you can share.